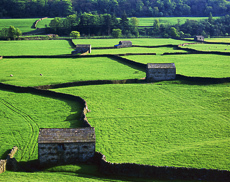 Autumn is a glorious season to experience the beauty of the Yorkshire Dales. Join me on this 4 night photography workshop to discover how this magnificent English county can improve your landscape photography. The Yorkshire Dales National Park is every photographer's delight with its rolling hills, field barns and drystone walls. 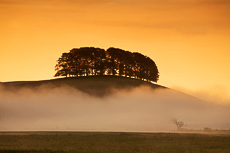 Home to some of Yorkshire's most iconic landmarks amongst its rivers, waterfalls and limestone crags, this area of outstanding natural beauty provides endless opportunities to create some dramatic images. We will be based in the charming market town of Settle, which nestles in the shadow of Castleberg Crag and from here we will explore the surrounding area and follow a flexible itinerary depending on weather and lighting conditions. The Yorkshire Dales National Park is home to many waterfalls and the powerful Hardraw Force, set in a natural amphitheatre, is England's highest single-drop waterfall. 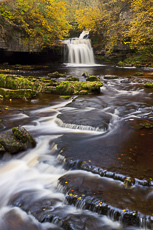 The beautiful Wensleydale villages of Aysgarth with its stepped Falls and West Burton with its scenic plunge pool waters, known as Cauldron Falls, are just a few of the possible waterfall locations we will enjoy experiencing. As well as exploring Wensleydale we will head over to the peace and tranquillity of Swaledale, one of the most northernmost dales in Yorkshire close to the Cumbria border. With unique limestone field barns dotted amongst its wildflower meadows, tumbling waterfalls and wild expanses of heather moorland, this is a landscape of stunning natural beauty. 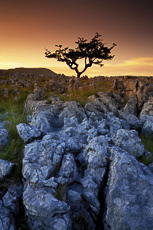 A highlight of this photography workshop in the Yorkshire Dales will be visiting the unique landscape around Malham Cove. Intriguing sinkholes and a curved limestone cliff face makes this a special place to photograph. The Limestone Pavement above the cove is one of the best preserved examples in the country and offers the chance to capture some truly iconic images. This photography workshop in Yorkshire Dales will precede the Lake District workshop so you may want to do both and/or also add on the Scotland workshop. With a maximum of 6 people, book early to avoid disappointment. This will give you quality time for individual tuition whatever your photographic level. There will be moderate hiking in the Yorkshire Dales involved so a good level of fitness and sturdy footwear are essential.